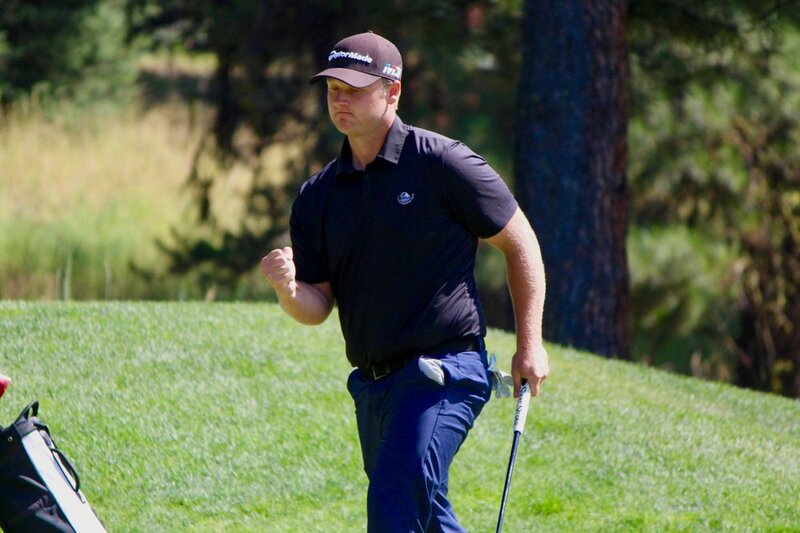 McCALL, Idaho – The winner of the 2018 Idaho Mid-Am came from a rather unlikely place. Matt Jensen of Winnemucca, NV shot 73-71-71 (215) to win by 3 strokes over Jason Huff and Gavin Parsons at Jug Mountain Ranch. Jensen recently moved to his wife’s hometown of Winnemucca from New Hampshire, making the roughly 6-hour drive to play in the Idaho championship for ages 25 and up. Jensen started the final round at even par, one shot behind Huff (Moscow) and Dan Stewart (Elko, NV). On the front nine two early birdies helped him make the turn at 1-under. Huff and Stewart both played the front 1-over and Jensen took the lead. The early stages of the back nine belonged to Huff. Two early birdies of his own gave him a 2 shot lead going into the 13th hole. Disaster struck for Huff as he took a double-bogey on 13, at the same time Jensen making birdie. Meanwhile, Stewart has rattled off his 9th consecutive par. Things were not over for Huff quite yet. Bogeys on 14 and 15 from Jensen opened the door. Huff birdies 16, and suddenly has a two shot lead over Jensen. The two difficult closing holes at Jug Mountain Ranch can often lead to heartache and Sunday’s final round had plenty of that. Stewart played the course very well all day, but wasn’t able to find the bottom of the cup on any birdie putts. Still, he was very much alive down only one shot going into 17. Jensen owned 17, making birdie while his competitors made bogey. The final hole provided a ton of drama in McCall. First up, Jensen found the fairway of the tight 435 yard 18th hole. Huff’s tee shot flared left, and he was forced to take hacks out of extremely thick grass to get it back in play. Stewart goes opposite into the wetlands on the right side, now forced to punch out short of the green. Jensen now had the upper hand. Sticking his approach to around 7 feet, he essentially had the trophy in hand. He proceeded to drop the birdie putt followed by a Tiger-like fist pump, putting the exclamation point on the tournament. In the Women’s event, Michelle Gooding of Parma, ID held on to her first round lead to best last year’s winner Karen Darrington by one stroke. Gooding went 73-80 (153) to capture the Women’s Mid-Am title.